Joe and I moved to Mossyrock in 1994 because it was all we could afford. It turned out to be a blessing. We found a beautiful, peaceful life. 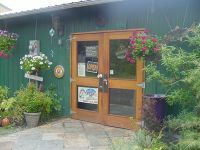 In 1998 we opened up Salmon Creek Meats in the most out of the way location you could think of. If you build it they will come. Ha Ha. Joe brought his experience from the Meat Shop of Tacoma to our business. He grew up there and worked in the family meat business from the tender age of 14. Joe's family was raising cattle "organically" before it became a catch phrase. Joe, Uriah and I manage a herd of beef cattle on our 19 acre farm; often on horseback. The aim is to create a stress free environment for the cattle. There is something to be done every day and in addition to the regular chores. It is far from a linear path. One day the fence is down. The next week a calf is born. Then the elements go out on the hot water tank. Then you fall in the horse trough. Then you thank the Lord nobody saw. Always something new and something to remind you how great it is to be alive.